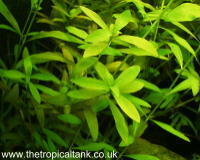 Comments An undemanding and popular aquarium plant which will thrive in a variety of conditions. In bright light this plant will grow very quickly and will need to be pruned regularly. Allow enough space between individual plants to allow the light to penetrate. Leaves turn reddish close to bright light sources, and varieties that show more reddish leaves have been cultivated.